Citizens who have information relating to crimes, criminal activity or fugitives can call 24 hours a day, 7 days a week. We offer the citizens of Summit County direct and easy access to their law enforcement community. Reward and anonymity are the incentive. 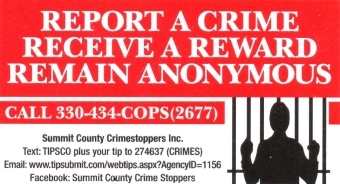 Crime Stoppers pays cash rewards for information leading to the arrest and indictment of a person involved in crimes in Summit County Ohio. Making Summit County a safer place to live is the benefit! Copyright © 2018 Summit County Crimestoppers. All Rights Reserved. Questions, broken links? Contact the webmaster here.